2. The right to strike is already severely restricted and practically non-existent for the majority of workers. The first of these facts is well known, the second less so. In fact, the dominant view in mainstream media and discourse is that South Africa is a striker’s paradise. Experiences of labour broker workers at Heineken’s brewery in Sedibeng, Gauteng provide a useful entry point into challenging this view. The affected Heineken workers are “labour broker workers”. They have been fighting a two-year battle for permanent jobs and equal treatment as prescribed by section 198 of the Labour Relations Act. During this time the company has done everything in its power to frustrate the workers, including dismissing two key leaders, Martha Xakaza and Sazisizwe Nkanzi. Eventually, emotions reached boiling point and workers engaged in an unprotected action. They did this because they could not go on a protected strike for either their main demand for permanent jobs or the demand to have their comrades reinstated. The Labour Relations Act does not allow for protected strikes during disputes of right, which is how both these disputes are seen. A dispute of right is defined as a dispute around compliance with a law, policy or collective agreement. Given the low levels of compliance, which hovers around 45% for sectoral determinations such as the one covering farm workers, it is no surprise that in the 2016/17 financial year only 5,038 of the 188,449 cases referred the Commission for Conciliation Mediation and Arbitration (CCMA)were disputes of mutual interest where workers had the right to go on protected strikes. In other words, in more than 97% of disputes referred to the CCMA, workers had no right to go on a protected strike to resolve their grievances. But even disputes of interest are not necessarily protected. 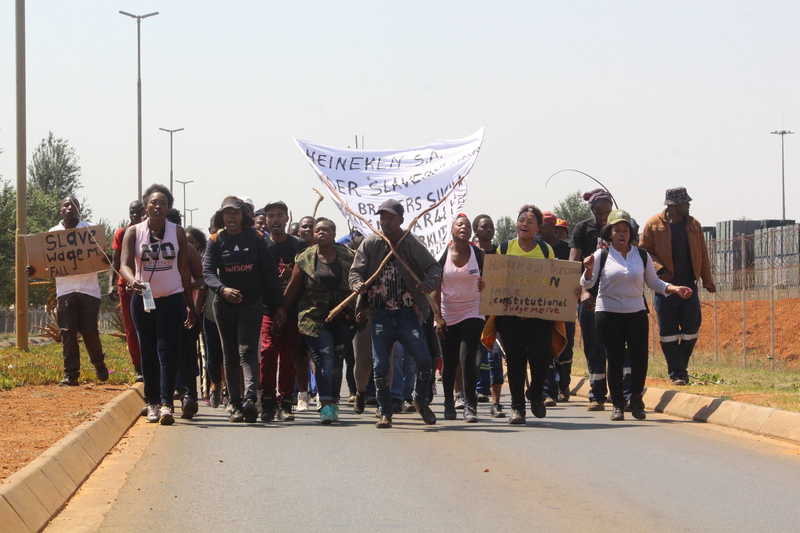 On 4 September this year, the Johannesburg Labour Court issued an interdict against the labour broker workers at Heineken, after the workers had notified their employers of their intention to go on a protected strike. The disconcerting, even shocking thing about this interdict was that it did not forbid any particular strike. Instead it put a blanket ban on striking as such. It made it a crime (contempt of court) for workers to exercise their constitutional right to stay away from work. The interdict was overturned on 5 October by another judge of the Labour Court, but by then it had disrupted the mobilisation efforts of the workers exactly as intended. In the experience of the Casual Workers Advice Office (CWAO) there is a general tendency for the labour courts to be increasingly inclined to issue interdicts that criminalise strikes, without bothering to justify them in law beyond the fact that the bosses really want them. The General Industries Workers Union of South Africa (Giwusa) recently found that the labour court had interdicted their members from striking after conducting a hearing at ten at night, without the knowledge of the union. 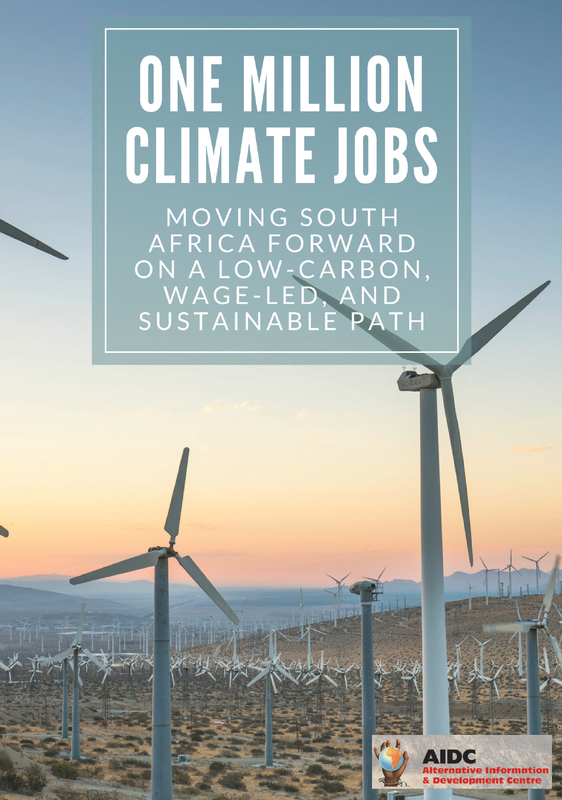 And of course the best-known case recently was that of the National Union of Metalworkers of South Africa (Numsa) having their plastic sector strike interdicted. NUMSA had the wherewithal and resources to have this interdict overturned, but it is easy to see how this tendency of the labour courts to criminalise striking undermines the right to strike. In our view the repressive drift of the labour courts is part of the attack on the working class in general and the right to strike in particular. 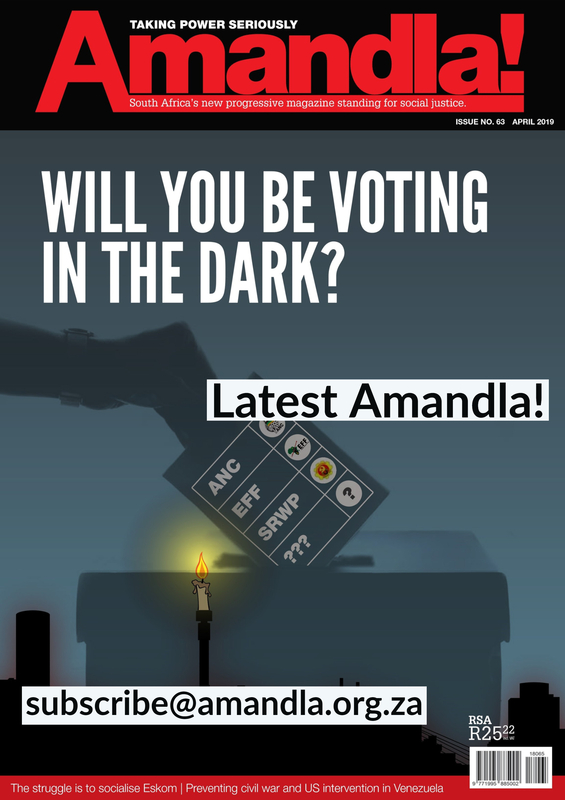 The state-capitalist power elite is taking advantage of the crisis in the labour movement and the reassertion of the dominance of white monopoly capital through the struggle against “state capture” to tighten their grip on the levers of power. Amendments placing further restrictions on the right to strike are about to be signed into law and these will strengthen the tendency of the labour courts to criminalise strikes. The Heineken workers had called the strike that was interdicted on 4 September around a demand for proper shelter for a small group who worked outside. Workers decided to declare a mutual interest dispute because they had become frustrated by the delays in the original case they had referred around their rights to permanent employment and equal treatment. They could not have a protected strike around this latter dispute of right, and their intention was to go on strike in order to break the deadlock, which is why they referred a mutual interest dispute. In the original referral they had demanded a wage increase, benefits and the above-mentioned shelter for the outside workers. To their dismay they found that they could not go on a protected strike demanding wages and benefits because those issues were covered by an agreement made in the Bargaining Council. They therefore had to remove their demands for wage increases and benefits from their dispute referral, despite the fact that neither they nor an organisation representing them were part of making the agreement in the bargaining council. Just over four million workers are covered for wages and other issues by Bargaining Council and other collective agreements. Most of these agreements cover at least two years. For the duration of these agreements workers cannot go on a protected strike about any of the issues covered in the agreement. These include wages, benefits, hours and most of the central concerns of workers. 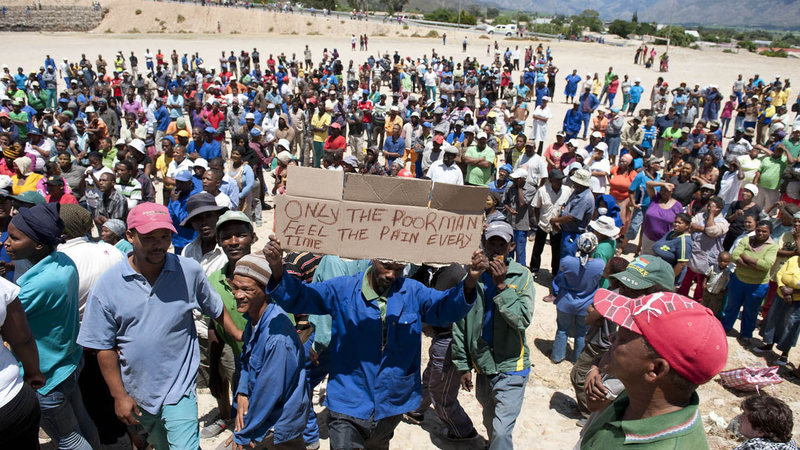 Workers who are the victims of a bad agreement that leaves them in poverty (the majority in South Africa) and who become organised at any point during the period covered by the agreement, cannot use their new found organisational strength to get a better agreement through going on a protected strike. This is the case for most organised workers, and the fact that these agreements can be extended to cover entire sectors means even workers who were not represented in the negotiations effectively lose their right to strike for years on end. The Heineken workers ran out of patience with the lack of a real right to strike and were on an unprotected strike as this article was being written. During the strike the police displayed the cynical brutality that is routine in their treatment of Black workers. On 21 November they called on the protesting workers to gather in a group, giving the impression that they wanted to speak to them. As soon as all the workers had joined the group, the police started firing at them with tear gas, flash-bangs and rubber bullets. Striking workers are treated as criminal suspects in South Africa, and those on an unprotected strike are actively persecuted for “illegal strikes”, despite the fact that there is no such thing in law. Millions of workers have such a restricted right to strike that they effectively have none. These restrictions are accepted and aided by the trade unions through signing collective and bargaining council agreements. The idea is that this is an acceptable trade off for the benefits that these agreements deliver for workers. This idea may make sense for a small layer of relatively well-paid workers, but for the vast majority it does not. The coming changes to the Labour Relations Act will soon make this situation even worse, both for the majority and for this small minority. The mine workers in Marikana and the farm workers in De Doorns in 2012 did not just willy-nilly embark on unprotected strikes. They had no choice. They did not have the right to go on a protected strike around the issues that bothered them. The trade unions found themselves lined up against these workers and took the side of the government and the bosses who had reacted as if the workers had launched a revolutionary uprising. In the experience of the Heineken workers, the trade unions have played a similar role. The workers had to build a new movement in order to seriously take forward their struggles for basic rights. This situation will happen more frequently and with greater intensity as workers find themselves targeted by the violence that goes together with an ever-shrinking “right” to strike. Ronald Wesso is media coordinator at the Casual Workers Advice Office, a non-profit organisation based in Germiston, Gauteng, with a focus on supporting the struggles of precarious workers.